Great job by Eric - especially on the title track, which captures the eerie, melancholy mood of the TV series perfectly. There's never been a TV series quite like Edge of Darkness, and it deserved a suitably unique soundtrack - and this is perfect. I loved this series in the 1980's when I was a wee lad. The score makes a good programme a masterpiece. Sometimes I sit alone and listen to the theme music to Edge of Darkness and it brings back all sorts of memories of Bob Peck back to me. Some sad some happy. I was working for A Nanny for Bob and hid family while he was making Edge Of Darkness, he was a lovely man. My only regret is that I never told him. So I'll sit and listen to the music again and think of Bob. Whom I loved very much. I have just bought a copy of the 12" inch single and I have enjoyed listening to it very much. Extremely atmospheric music. The guitar work is "sublime" (as Pete Townsend once said), dark and haunting and so fitting to the dramatic nature of the series. I have to give it 10 because I only have two Clapton works, this and Unplugged. There's a lot more to Unplugged but Edge of Darkness is far more dramatic. Worth mentioning that mine is the 12 inch vinyl with the more stylised cover (which I prefer). I also have the series starring Bob Peck on video. It's a fantastic drama, made all the more energetic by this fantastic score. Look out for it. While Eric had on occasion shown himself able to dish up some tasty instrumentals (e.g. 'Slunky' from Eric Clapton and 'Peaches and Diesel 'from Slowhand), his transition here (in collaboration with Michael Kamen) to full-blown soundtrack composer is quite stunning. On this album, the metronomic drumming, Kamen's dark orchestral textures, and Eric's bleak guitar tone combine to conjure perfectly the post-nuclear landscape that underpins the excellent BBC TV series. 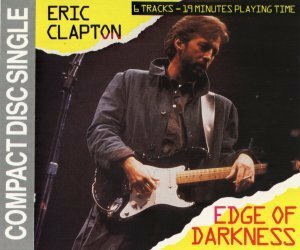 On three cuts, Clapton and Kamen effectively rework the central musical theme (including one acoustic reading), while on 'Shootout' and 'Escape From Northmoor' Eric gets to stretch out a little - offering some particularly visceral and fiery lead work in the process. In my opinion, none of Eric's subsequent soundtrack work comes closes to the stark brilliance of this first effort. I have no idea that "Edge of Darkness" was a song for a TV series. This song and "Theme From a Movie that never happened" are my favorite "especial and no traditional" (rock or blues) Eric Clapton's song. It's wonderful, a masterpiece. I first heard "Edge Of Darkness" on the "24 Nights" live concert album. I am one of Eric's devoted fans so nothing he does is wrong, but in my opinion (not a musician's critic) this is my favorite song. I wish he would do more with full orchestra backing. The feeling evoked from listening to this music matches the intention of the piece. I listen to it over and over again. It arrived in the post this morning and I put it on for the first time. And I thought was a great single. It's unfortunate that this single cost me £40 but I would say "It's worth it!". I think the quality in his playing in this single is outstanding, no lyrics, just great music. I suppose that's one reason why I like "Change The World - Instrumental" and "Danny Boy" so much. Just great tunes.